Lieutenant Yasir Abbas was concerned with the oath that he took; the oath which declared his life secondary to Pakistan’s security. I have always been a supporter of the extravagant budget spending on Pakistan’s defence. The high global ranking of our military has always served as reason for me to maintain my stance and argue in favour of the forces. In debates with friends and colleagues, I have, several times, flaunted the fact that if there is one great thing about Pakistan, it is our defence. Unfortunately, this all changed recently. Little did I know that the forces I talked so highly of would miss an ‘unknown’ number of people jumping in to one of the most valuable bases in Karachi, just because a 25 degree tilt in the boundary wall prevented the security camera from capturing them. Interior Minister Rehman Malik’s press conference embarrassed me. In fact, while listening to him, my Pakistani identity started to discomfort me. Two of the terrorists succeeded in escaping from PNS Mehran during the operation. Mr Malik confirmed this figure, as the two suspects were actually seen escaping. We don’t even know how many unseen people escaped. I did not know what I felt more, embarrassment or regret. If I wasn’t a patriotic Pakistani (yes, I still have patriotism but can’t say the same about hope), I would have laughed at this country which spends almost irrationally on defence but fails to protect its bases within a populated city, let alone its borders. I was thinking what the international response to this blunder would be. I wondered if there was an attack on our borders during the PNS operation. How safe would we have been on a scale of one to ten (one being ‘not safe’ and ten being ‘not safe at all’)? There was a lot going on in my mind. However, there was another group of people, with another level of dedication and commitment which was fighting to keep Pakistan safe when the whole nation had lost hope in them. Lieutenant Yasir Abbas was concerned with the oath that he took; the oath which declared his life secondary to Pakistan’s security. When we had anger and disappointment oozing out from every pore, people like him fought to protect us. They fought and gave up their lives, because a 25 degree tilt in the boundary wall prevented the security camera from capturing terrorists jumping in. I don’t know how big a fan I am of the Pakistani military now. But, the men who lost their lives fighting against the Taliban or al Qaeda (or whoever) certainly deserve much more respect. Those who lost their lives at the general head quarters in Islamabad and those who died fighting against the terrorists in Karachi paid the huge cost of internal security lapses. I used to brag about the Pakistani military. I had complete faith in them. When the government hiked up the defence budget by 11.7 per cent for the current fiscal year, I did not object. In fact, defence allocation was the only thing I was completely at peace with. However, when these forces took 16 hours and lost 13 of their men fighting against a still unknown number of people, I was forced to revise my opinions and patriotism. I apologise to whoever supports an institute which can’t protect itself. I apologise for not raising objections at the increased defence budget. I should also extend my apologies to people who gave up their lives fighting as part of the military which does not realise their value. I am not a believer of “death comes when it has to” and I believe that this phrase is over-rated and over-used to comfort oneself and to prevent people from looking into what could have been done to avert the outcome. Lieutenant Yasir did not have to die. The dedication he possessed was not one which we could afford to waste. It was because of people like him that our forces are ranked high internationally. An exchange student in Waseda University, Tokyo, studying Liberal Arts and teaching English. She is interested in social development specifically in the education sector. Colonized minds: Are we English Pakistanis? People would rather blame Zardari and Gilani for this mess, but NEVER will they dare accuse the actual incompetence found in GHQ and ISI about their 3 decades of support to Jihadi groups and playing double game in the name of ‘strategic depth’ that has led to the deaths of 35,000 Pakistanis because of Taliban bombings and assaults. to be honest I have no faith anymore on our defence. Until our corrupt generals are playing double game and foregin money is involved, I donot think they can earn public sampathies. Its the time for junior officers to stand against corrupt leader within army. Whoever replaces stay your nose away from politics and stop supporting Anti-Pakistani organisations like LeT, Sunni Threek, Sipa Sahaba, MQM, MMA, PML N, etc etc.. Similarly stop listening to Isamic nations like Saudia Arabia, Iran, UAE, Dubai etc. Solve that bloodly Kashmir issue. We are paying through our noses for the defense of Pakistan,major chunk goes from our budget,another chunk in shape of tax exemptions and subsidies to the Army welfare,Fauji Foundation , the BMWS the land cruisers and in of course the D.H.As of the country. On the flip side, the police, FC, rangersr are poorly equipped and poorly trained. Yet they bear the brunt of terroist attack. What has been done to improve their lot? Nothing. Instead as part of an austerity drive in Punjab police, the use of paper, paper clips and staplers is being restricted. Today 12 policeman lost their lives in Pwr. Not a wimper from anyone to support them. @alee ahmed what are you talking about man! ur on dope or something, dude the attack on NAVY base has nothing to do with Pakistani people hibernating its an out right lapse of intelligence, security and surveillance. neither of us knows the actual incident. Can you actually believe that 4000 personnel surrounding the pns base.. and yet 2 persons can escape? May be they are only quoted “escaped” for some reasons. do you seriously believe the 4 men can give resistance to the military commandoes who were re inforced again and again? but this gives u know right to criticise our soldiers…our army..
they are the ones because of whom we are able to use internet sitting in our houses peacefully. People who have lost their FAITH in any of the three branches of military can go and live a prosperous life in India. It is really easy for people like Kanza and those who support her to sit on their comfortable chairs, sipping away on their coffees with their Apple Macs in front of them to comment about the “security” situation in Pakistan, than actually going out there and do something PRACTICAL about the country. For God’s sake, there has been lots of negative propaganda already going on regarding Pakistan and its security failures. Didn’t the 9/11 attacks happen in America. Wasn’t the Pentagon attacked? The American media didn’t started maligning the image of their security forces, instead the whole nation got united for those who actually lost their lives!!! But thanks to the media personnel like Kanza, whether they belong to the print media or the electronic media, instead of uniting the nation they are dividing it more! Unity is Strength is one saying that our people belonging to any walk of life have failed to understand. Lt. Yasar Abbas died a hero’s death for his country and his army. But neither the country nor the army accept any blame. In fact the army rules over the country. It trains jihadi assets and exports them to neighbors and rest of the world. It now sends young officers like Lt. Abbas to undo the evil it has created and nurtured! – but only in a tactical and minor manner. The Navy commander has already said, “there was no security lapse”. Rehman Malik blames it on Star Wars type characters! Imagine what Lt. Abbas’ family must be going through. This is sheer hypocricy on the part of the powerful. The high global rankings of the Pakistani forces were there for a reason. Whats more scary is the fact even after such recognition internationally, we were subject to an internal security lag. Whats more shocking is that we could not even confirm as to how many terrorists jumped in to our crucial base. Those who did should still respect the Pakistani forces, but this security lag needs to be questioned! Their respect should be backed by realism, and realism demands fingers to be pointed at what happened at PNS Mehran. Ma’am respecting your opinion but i dont think you git it right there. People like lt. yasir die for this country because they want to…they always have a choice always whether o turn their backs on their country or not. he made his choice when he decided to go straight into action and he succeeded in achieving that when he took the first bullet. as far as the defence budget is concerned do you know how many hostile countries exist on our borders, not to mention all the external and internal threats. you were right to be proud of them but you were wrong to vilify them. @Tehniat Ahsan: Pakistan’s problems with extremism will only be solved, if there is a free and open dialogue on the issue. Calls for unity are equivalent with call for sweeping problems under the rug, instead of solving them. Look at how well it served the Soviets. If people have lost their faith in the military, it’s about time. Do not send them to India, they are Pakistan’s greatest hope! in these difficult times the army and the ISI need our support! !dont fall into the trap of our enemies who want to weaken the only efficient and credible institutions we have however less that efficiency might be(and im not convinced it is as less as people r making it out to be)! !dont forget that our agencies and the army have limited resources in comparison to our enemies and in comparison to the magnitude of the task at hand! !please dont believe watever the media feeds u and please start taking responsibility tourselves rather than blaming zardari or kayani or whoever. First of all my deepest apologies to our heroes who lost their lives for the sake our motherland. The land which do not belong to us anymore. I’ve read some of the above comments and i’m just impressed with the maturity level of you all. You still are blaming talibans? Because whenever we fail to capture the terrorists it’s taliban? Why is that so that as soon as any such incident happens Rehman Mailk gets an immediate phone call in which the taliban leader has taken the responsibility? Who thinks so high of him anyways…. Kanza, this is the fine piece of article I have ever read on Tribune. I will still support my military. Am still not hopeless. Am still a patriot , the incidents like these make us feel that how much we love our country and how much we owe it to it . The anger which grew among us because of our failure is because we love our country . We cry because we want to see this land a place to live . Dont be hopeless . Jinnah Said : “Musalmaan musibat main ghabraya nahi kertay ” , our military have always proved it. So which is the best military in the world? US? It lost 5000 lives in Iraq more than 20000 in veitnam. Still think the same? So which is the best intelligence agency in the world? CIA? It was due to failed intelligence that 911 happened and no WMDs were found in Iraq and by the way in Afghanistan, 7 CIA workers were killed in 2010. Still think the same? Have you ever heard US media chastizing their military and intelligence even after their repeated failures(and I have only quoted few examples here that are well known). They know very well how important are these institutions to national security and morale of tha nation. Perhaps the people like Ms.Kanza and her admirers, fail to understand this simple fact! Pakistan Army and all defence institutions of this pure nation. We stand shoulder to shoulder with you and will not think for a second laying our blood in the defence of our homeland. You will find countless Yasir Abbas among your ranks! Hello this is is nasir from islamabad ..the tradegy of PNS mehran has indeed pierced my heart as i also belong to navy background. The valour of Yasir is indeed commendable but i am not able to convinece myself that he deserves Nishan-e-Haider (Highest military award) for this..He was shot down as soon as he jumped out of his vehicle..i am not saying that there is no bravery in getting in the line of fire without caring for ones life but u see he wasnt the only one who was shot down, there were 11 commandos who died that day.but i havnt seen any news channel talking about them and about their families..they too are our hereos and i dnt knw why we are giving so much importance to only one person…do correct me if i am wrong in my point of you.. Hats off to u kanza…u reflected the thinking of majority of Pakistan! Yet it is unfortunate that r losers in incompetant govt and military establishment are showing no sigs of any repantance, any shame and accountability…. the Nation is united on accountability of failed personnel n Pakistan has a resilient nation wd active media n judiciary dat belives n rule of law so it is time we hold r intelligence agencies n govt accountable, only dat would strengthen o…ur institutions…we hav v talented n much qualified people so the failed ones hav to quit, its not pointing fingures, its a blatant failure of r national security n whoeva sleeps now is criminal ….go shameless general pasha go! yes gen pasha n air n naval chief’s resignations wd start accountability process to clean up r institutions from failures…personalities r nt important countries becum strong by strong competant institutions…think wat use a military is if it doesnt hav any public support…v should learn 4m 1971 n hold accountable military generals who betrayed us repeatedly n 1971, kargil, lal masjid, bugti killing n now abbottabad…. 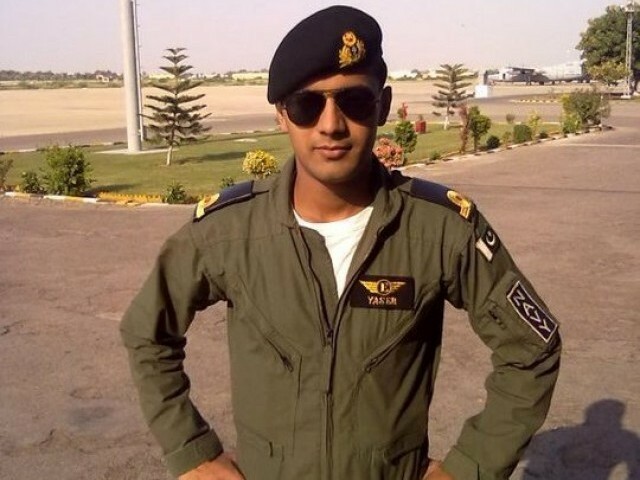 Just make one thing very clear.Lt Yasir (Shaheed),was he a spare child of his parents.Was he surplus.He was the only son and brother to 3 sisters.What about his parents?what about their senior days?This has become a routine now.Please tell me what is high alert?This all is crap.Lt Yasir(shaheed)was a son of the nation.An educated,young,energetic,smart individual who could have contributed a lot to the nation.An Engineer and a soldier.He was a real investment by the country. well i support the writer, there was nothing big from the navy personal ,against five got killed 10! and the equipments! The article does raise some valid questions however, I must say that despite everything I still have not lost confidence in my armed forces. Yes clearly there is an agenda to alienate Pakistani people from ISI and the armed forces. The statements coming, the things happening everything points to that direction. I dont know how the terrorists came into such high gear and I dont know how they knew exactly from where to go and what to do and I dont know why it took 16 hours but I will still not criticize the armed forces because I dont know what exactly happened. Until I know my facts I will refrain from saying things like many people said and a few statements from the article. Few of the conceptions (or rather, misconceptions) about Pakistani Army must be cleared. Firstly, the Army cannot justify such a huge budget when the entire country is racked with internal problems including, but not limited to, economy meltdown, power shortage, rising intolerance and illiteracy, etc. People who question such a huge budget and un-necessary advantage to Army personal are targeted morally and physically. They are even picked up by the agencies, taught a lesson, and allowed to go – or they are simply killed and their bodies dumped. Similar plight is faced by hundreds of Baloch, who are being targeted not due to any anti-Pakistan activities – although there are certain sections of Baloch population which indulges in such acts – but are targeted simply because they have the balls to ask Pakistan Army certain Hard questions. Secondly, Pakistan Army believes it is above law and therefore, it cannot be held answerable to anything. The attack on GHQ was brazen but no head of any general ever rolled. At PNS Mehran, similarly no Navy officer retired or was forced to retire following such a bad show. Buddy you summarized it all in the best and comprehensive manner possible ! I wonder how many more mothers, they are thinking, must sacrifice their sons before they actually start thinking it’s about time they got off their back sides and did the job they are paid for, their weight’s worth in gold every month? What, however, even my tiny brain DOES understand is … neither they nor their own sons will ever be asked to guard the bases. So no skin off their nose come hail, rain or shine. And anyway their lives are far too valuable and blood nobler to be lost for under twenty thousand rupees a month. Isn’t that really mine and Lt. Yaser job! and with regards to the budget allocation …. if the balance any time soon is not shifted in favour of education, health care and civic amenities we will forever be digging ourselves out of the hole and will never be able to ofcourse! If the results on the table are anything to go by, we certainly got to have been barking up the wrong tree for the past 60 years. I heard an event called “Marathon de Incompetence” has been organised for Sunday the 28th of May. Its the 27th of May today and I wanted to take part but I’ve been told I can only come 4th or less because the top three positions have already been taken! WHY ONLY Yasir, there were others also, BUT, Jawans and non gazetted officers so no mention of them ????? The Navy and in fact our Defence forces should apologize to all those young officers and low rank people who have died due to their wrong policies and incompetence. How many of us including the media knows the name and face of all those who died besides Yasir ???? WHY were they not important………. Most of these who are bashing Armed Forces and ISI have one thing common and that is LACK OF KNOWLEDGE. Our Armed Forces are made of human beings and they do not have extra-human capabilities. Humans do commit errors, mistakes and even blunders. You are only focusing on one successful terrorist attack and drawing your venomous conclusions. No one is against accountability – that must be done across the board. Many people got extremely furious once Naval Chief Said, “THERE IS NOT A SECURITY LAPSE”. Naval Chief was right and you got angry due to lack of in-depth Knowledge. I feel like laughing on pigmies like Asheya Siddiqa who have only lifelong mission of disapproving everything belongs to or done by Armed Forces. I support the statement of Naval Chief because – There was NO Security Lapse on the Part of Pak Navy !!!!!! PN officers and men responded within seconds of the attack, fired back and towed their planes inside hanger while under fire. However, There was a BIG Security Lapse on the Part of PAF who is custodian of PAF Base Faisal. Please understand that PNS Mehran resides within PAF Base Faisal. There was a Security Lapse once terrorists crossed the perimeter fence. How they knew about blind arc ? There was a Security Lapse once terrorists walked few kilometers from perimeter fence to main runway. Passed close to C-130 planes of PAF and never touched them. How come sentries of PAF guarding C-130 did not challenge them ? There was a Security Lapse once terrorists took positions along run away and fired rockets on P-3C Orion aircraft while standing on PAF soil. There was a Security Lapse once none from PAF ever fired even a single bullet during first hour of attack. PAF guards were probably waiting for orders from their officers. Please educate yourself before you start condemning those who are risking their lives for you people. @Khalid Masood……….’Our Armed Forces are made of human beings and they do not have extra-human capabilities.Humans do commit errors, mistakes and even blunders.’ This should be made to understand by the forces people themselves coz it is they who think that they are ‘UNTOUCHABLES’. This is a really well-written piece with well thought out arguments and a novel approach. Never being a patriot or pro-military myself, I still can relate to your pain and deem it important that the death of so many men in the forces being taken seriously, for once. However, I’d like to point out that to be human is to err. Everyone makes mistakes and though it’s a grave one, and I am not justifying any party here, we should accept that our defense has certain constraints. They can’t defend themselves how they can protect us? unknown number of terrorists? 4, 5, 20? 16 hours of operation against them? Did Anyone visit PNS Mehran or know the location where this incident occurred?